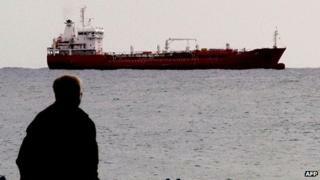 Image caption Cypriot officials described the cargo of the Russian ship as "dangerous"
On 10 January, a Russian cargo ship loaded with containers from the country's main arms exporter made an unscheduled stop at the port of Limassol in Cyprus, apparently forced from the sea by bad weather. Port officials who boarded the ship discovered what was described as "dangerous cargo". A well-placed source has confirmed to the BBC that it was carrying tons of ammunition destined for the Syrian security forces which stand accused of committing atrocities against their own people, killing and torturing thousands since the uprising began last year. The ship was held for several hours at Limassol before being allowed to sail on, eventually reaching the Syrian port of Tartus a few days later. This was just the latest consignment of arms and ammunition sent by Russia in support of the Assad government, a close ally with whom Moscow has maintained good relations for decades. According to some estimates, 10% of Russia's global arms sales go to Syria, with current contracts estimated to be worth $1.5bn (£950m). Besides ammunition, recent sales have included military training aircraft, air defence systems and anti-tank weapons. The current Syrian government also provides something else Moscow craves - the prestige of a navy base at the port of Tartus which is Russia's last base beyond the borders of the former Soviet Union. While the Russian government says that continuing to sell weapons to Syria is not in contravention of any arms embargo and is simply the fulfilment of existing contracts, Western and some Arab countries are becoming increasingly angry. "It is glaringly obvious that transferring weapons into a volatile and violent situation is irresponsible and will only fuel the bloodshed," said Britain's ambassador to the United Nations, Sir Mark Lyall Grant, in an unusually blunt statement at a recent meeting of the Security Council. This frustration with Russia's continuing support for Syrian President Bashar al-Assad is likely to come to a head this week as several members of the UN Security Council push for a quick vote on a new resolution on Syria which was tabled last Friday. The resolution, which condemns the violence inside the country and supports an Arab League peace plan under which President Assad would step down, is another opportunity for the international community to take a united stand on the crisis. The last time a resolution was tabled, back in October last year, both Russia and China vetoed it fearing it could ultimately lead to foreign military intervention in a re-run of the diplomatic manoeuvring ahead of the Nato bombing campaign in Libya. But since October the situation inside Syria has deteriorated sharply. The country is perilously close to civil war as the ranks of a rebel army swell with defecting soldiers and as government forces step up their assaults on towns and cities now that the Arab League monitoring mission has ended in failure. In these circumstances, some Russian politicians are starting to sound doubtful about their policy of shielding the Syrian government from international condemnation. "We have a feeling, which is becoming stronger, that there is a kind of a game being played by Mr Assad and his government," says Konstantin Kosachev, deputy head of the Russian parliament's foreign affairs committee. "He does make promises, but he never fulfils these promises so we are not happy with Mr Assad." Moscow's long-standing position is that both the government and opposition in Syria are equally to blame for the violence and that the solution lies in bringing the two sides together for talks. But so far there have been no negotiations. Mr Kosachev made a surprisingly frank admission that his government's policy on Syria could change abruptly. "If and when we understand that the conditions for any political dialogue are exhausted, we will definitely stop preventing any further actions in the (UN) Security Council," he said. "But we are not in that situation yet." In a sign that the tempo of international diplomacy is quickening, Russia announced on Monday that it had offered to host talks in Moscow which the Syrian government has agreed to attend. But an opposition organisation, the Syrian National Council, rejected the offer saying President Assad had to resign before there could be any negotiations. It is not clear so far whether Russia will use this to justify continuing support for the Assad government and a veto of the new resolution, or if it could decide dialogue is impossible and therefore let the resolution pass. If ultimately Moscow does withdraw its support for President Assad, there are some who believe it could prove terminal for him. "The regime would feel extremely isolated, would feel weakened and the morale of Assad supporters would decrease substantially," says Malik al-Abdeh, a Syrian journalist and opposition spokesman based in Britain. "If there is a realisation within the regime that it is falling, that it has lost the confidence of its own allies internationally… influential members of the regime will try to defect, perhaps escape to neighbouring countries and this is when the regime would probably crumble very quickly." To compensate Russia for any loss of influence and trade in the Middle East, some analysts say countries such as Saudi Arabia and the United Arab Emirates could step in. "Russia's strategic interests in the region don't start and finish with Bashar al-Assad and in fact its strategic interests in the entire region don't start and finish with Syria," says the director of the Brookings Centre in Qatar, Salman Sheikh. "With regard to countries like Saudi (Arabia) and the UAE, there are certainly partnerships which can be formed and there are arms that can be sold."